Puffles the Dragon Fairy (@Puffles2010 on Twitter) is standing for election! See here in the Cambridge News! This is an appeal encouraging you to take part in local democracy in a way that has not been tried before in Cambridge. Please read this digital democracy pledge at http://www.pledgebank.com/DigitalDemocracy (or see here on Facebook). Please ask questions of anyone standing for election in your area – in particular via email and social media. Please give them feedback using social media, and share your experiences with family, friends and contacts. Just as importantly, please tell them why you are voting for them – just as I did with Cllr George Owers in 2012. It’s just as important for local candidates to know what they are getting right as well as what they are getting wrong. …have a look at our manifesto for Cambridge. Unlike other manifestos, me and Puffles invite you to make suggestions on things you think would improve it – and improve Cambridge. If there are any ideas that you like in the manifesto, please tell the candidates/parties standing in your area and ask them what they think. …and you still like the ideas in our manifesto, please write on your ballot paper “#Puffles4Cambridge”. It does not matter which ward you live in. Although nominally standing in Coleridge, both the digital democracy pledge and the manifesto are Cambridge-wide. (The pledge template is universal – if you are outside Cambridge feel free to adapt it to your area). By writing ‘#Puffles4Cambridge’ on your ballot paper, your vote will be counted. It will also make it easier for people at the election count to note the number of ballot papers containing this, rather than a cross in a box for a candidate. This will then show if the ideas in the manifesto are popular with people across the city. If you are too young to vote, or are ineligible to vote, you can still make suggestions, post questions and demand answers from candidates standing in your ward! Use social media and share the responses you get back! Like the ideas in our manifesto? Please post “Puffles4Cambridge” on the social media pages of the local political parties. Just because you can’t tell the parties what your views are through the ballot box doesn’t mean you can’t use the comments box on their social media pages! With Puffles, even if you don’t have the vote you can still have your say! This time, your voice will be heard by the local politicians because a feature of this campaign is to get people who don’t have the vote using their voices en masse. Interested in helping Puffles spread the word on democracy? Get in touch! Can Cambridge show that we can go beyond traditional methods of campaigning? It’s your city. Be the difference. 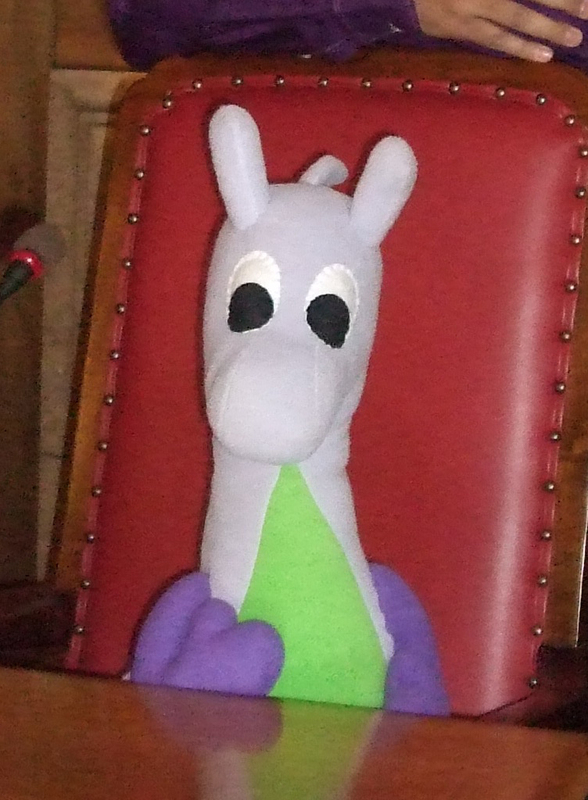 Puffles the dragon fairy occupying the Mayor of Cambridge’s throne in one of the Guildhall’s committee rooms. Summary: Some thoughts on crossing the political threshold. It scares the living daylights out of me. (For those of you not aware, I have a mental health condition known as a general anxiety disorder for which I am on medication. I’m also recovering from mental exhaustion which at the moment means I cannot work full-time). #Timetochange. Setting yourself up for something like this is a very big deal. I can’t say it wasn’t coming. This angry blogpost led to me and Puffles being on the front page of the Cambridge News – see their article here. The closer the deadline date for nominations to close, the greater the pressure I’ve felt to stand. And yet, as I look around, I see no one by my side. I don’t have a party. I don’t have an agent. I don’t have a ‘running mate’. I don’t have a team of activists to campaign with or go door-knocking with. I am putting myself forward to become a member of an eclectic group of people: Independent candidates. 4) Give four pieces of feedback to the politicians on what you thought of their answers. Did you agree/disagree? Did they inspire you? 5) With five people, share your experiences of 1-4 – family, friends, contacts. Tell them what you thought of the responses you got back from the politicians and encourage them to take the challenge. https://www.facebook.com/CambridgeTories… – baseline unknown as a ‘Friend’ account, not a fan page. It could make absolutely none. Not a single additional Facebook ‘like’ for any of the parties, and not a single additional non-voter turning out. It could have a negative impact. If citizens make the effort to get in touch with local candidates and get weak/unconvincing responses – or worse, no responses at all, the impact could be citizens being even more cynical about local democracy than they already are. It could go viral. Which is sort of what I hope – that hundreds – if not thousands of people across the city – in particular young people and women, proactively seek out the parties standing candidates in their wards, and shower them with questions and suggestions on improving Cambridge. On top of that, I hope this will lead to lots of new faces getting involved in local democracy, leading later on down the line to a whole host of new candidates across the piece. Puffles could get more votes than the Liberal Democrats. I jest! One of the complaints we’ve had in Coleridge is that none of the other parties here campaign. By simply being there, the other parties will have to consider whether they can ignore Coleridge as in the past. The last thing they want is to get fewer votes than Puffles. It just so happens I live in a traditionally safe Labour ward. Puffles could get elected. Please. Just No. Me and Puffles ***don’t want to get elected*** My local ward councillor who is standing for election is Labour’s Cllr Lewis Herbert – leader of the Labour group on Cambridge City Council. He’s one of the few Labour councillors (given they are expected to take political control of Cambridge City Council) with the experience and competence to lead a council. What Cambridge does not need is for him to get defeated at the ballot box by Puffles. Also, I like Lewis. The week before Easter Sunday he popped round for a chat (he lives up the road) on all things community action. We had a long & detailed conversation. He understands the issues and wants to make an impact both using social media and getting young people involved in democracy. (See item 8 of the open forum at this recent meeting). He’s in the wrong place at the wrong time. Simple as. Hence not actively campaigning either against him or for votes in this ward. The problem as I see it is a city-wide one. It goes beyond individual political parties and even the two councils in Cambridge.” I’m aiming for something much bigger – as I described in this blogpost. At the same time, it sends a very strong message to all of the local parties – and the other councillors up for re-election in 2015. Anyone standing for election for the first time is crossing a big political line. It’s one thing to complain about politicians and politics. It’s quite another to do something about it. It’s off the scale to put your reputation on the line and stand for election – especially if you are not a paper candidate. Put simply, it means that local political parties have to react and respond. Puffles’ unpredictable nature: By extension I mean my own. Although this campaign is going to be a positive non-threatening campaign that breaks lots of stale and narrow conventions, at what point will the dragon turn around and bite? The first two I don’t know the outcomes of. The third one is where it gets interesting. There’s the ‘day-to-day’ challenges versus trying to predict what might happen in the longer term? Will I stand for election in the future? As Puffles or as myself? In which ward/division/constituency? How do we cope with someone who is prepared to stand against one candidate in one ward while providing free help to another candidate in another ward, when both candidates are in the same political party? Finally, how do the three main parties locally deal with a candidate who has worked inside central government in Whitehall policy teams for ministers in each of their parties? If we get a significant increase in the number of new faces and people from a greater variety of backgrounds coming forward, combined with a significant increase in the number of councillors and activists using social media to reach out to new audiences, then I won’t need to stand again on that platform. (That’s not to say future democracy issues won’t arise where I may choose to stand). On the other issues I’ve listed in the manifesto, there are other ways of making things happen – ones that I feel more comfortable with. In a much more calm and relaxed state?!? In all seriousness, I hope this makes a positive difference. I hope there won’t be too much pain on my part, and that I learn lots of interesting things and meet some great people. I hope that this will inspire others to step forward, get involved in the future of our city and make it a better place for everyone that lives, works and studies here. Me and Puffles have stood up to be counted. And as things stand, we are alone. Not a good place to be with an anxiety disorder. We need you to stand by us as the going gets choppy. Because it will. Next postDid the Mandelson-Campbell model kill off doorstep party campaigning? All I can say is ‘good on you Puffles’, and I really mean that. Though we have crossed paths just once and only spoken very briefly, I have followed your blog for some considerably time and consider you to be a thoroughly decent human being who will be a credit to the people of Cambridge, if you’re elected.